Mr Buu stole some time to have lunch with me yesterday and we decided to visit the German place which was a stone's throw away from me office. We were the only customers around and hence, service was prompt and personal. Both Buu and me went for the set lunch. 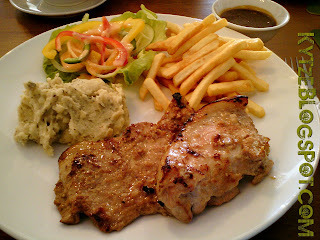 Buu chose pork chops as his mains while the witch dived for the pork stew which sounded mighty comforting. We were given the choice of a soup and 2 side dishes each. I was curious about how a potato soup would taste like and opted for it and keju-giler Buu gleefully selected the cheese soup. Food here appears to be made from scratch. I love how homely the soups tasted. It was none of the condense gunk we get from cans. Pleasant surprise, definitely. 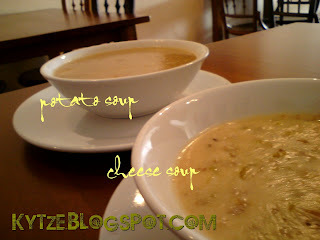 My potato soup was sweet and reminded me of the corn soup mum used to make at home. However, my throat felt tight after a few spoons. Wonder if it's because of the salt. The sensation was akin to tasting tomato paste in its raw form and having the throat tightening from the tartness. On the other hand, Buu's cheese soup was lovely. It had minced pork, celery, onions and a subtle hint of cheese. Tastewise, delicate and not meant to overwhelm. The pork chop was the winner of the day as it stole our hearts away with its juicy texture. Well-marinated and tender, it was porcine heaven unfolding in full glory. Yut Kee's Hainanese Pork Chop pales so much in comparison to this. The latter's pork chop had never impressed me with its dry texture. The sight of the pink flesh on the former makes me wish I had ordered that instead. Extremely alluring~ I could only sneak envious looks while Buu relished in his bliss. Buu had a side of french fries and mashed potatoes. 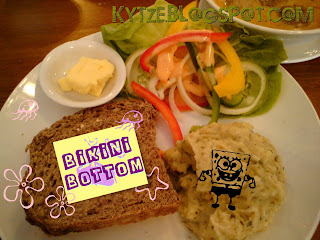 The fries was forgettable and the mash was pretty plain too but served a purpose as I discovered later. 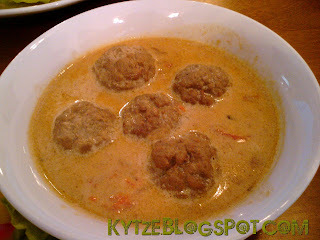 My pork stew came with 5 meaty pork balls swimming in it, which I couldn't finish. They were very filling but rather ordinary tasting. The stew was hearty and very rich and had bits of carrot. The side of toasted multigrain bread came in handy to mop the sinful liquid up. I must say the cook was rather heavy handed with the salt. I'd wanted to finish the stew but gave up due to the saltiness. Me fren Bob says he likes the bread! Apart from bread, the parsley scented mash also helped me to neutralise the saltiness of the stew. It was therefore plain for a good reason. Initially I'd been hankering to taste some sauerkraut. Hence I was more than a tad disappointed when the server informed us that they had no sauerkraut that day. eeeek. The blasphemy is tantamount to visiting a Thai restaurant without tasting its kerabu or tom yam. Okay, maybe I exaggerated a little. Better luck next time. 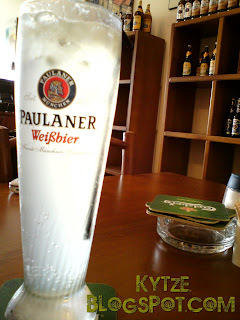 The rich meal was washed down with a tall glass of cold & refreshing Limonade (RM 5). We enjoyed the lemony-ness as it was just right and not too tart. Nice to burn the fats. So we wished. hee. sounds like a great place to dine in. Absolutely love food made from scratch ! I google this place that I just "discovered" (from exploring my foursquare maps) and you came out tops in my search. I shall review this place before it gets popular! Oh god I would not return to this place. The food was mediocre and the bratwursts were very disappointing. And I do love my pork sausages! Towards the end of the meal, my boyfriend crunched into an eggshell in his bratwurst! When we complained to the manager. She was most unhelpful and merely said that she doesn't know anything about the food as her workers and husband are in charge of it and walked off. The other 2 waitresses serving us were very unhelpful as well. It was a Saturday night and we were the only party dining there. I'm not surprised and will never return. 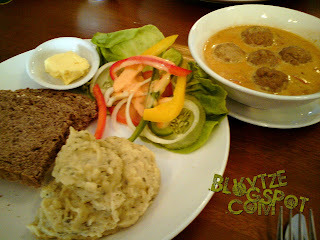 There are plenty of great German restaurants in the Klang Valley. Don't waste your time here! I'm sorry to hear that you've had such an unsatisfactory experience. I do agree with you that the service can be improved. For me, it is the waiting time.